It’s that time of year when the MCC’s Traditional Arts Apprenticeships are wrapping up for the year. As part of the grant program, recipients are required to share what they have learned in a public presentation. This coming Sunday, May 19th, two master/apprentice teams will perform musical selections and share some of the joys and challenges of transmitting musical heritage. The free presentation takes place at Lowell National Historical Park Visitor Center theater, 246 Market Street and will begin at 2:30 p.m.
Two continents. Two ancient percussive traditions. And two young people with the good fortune to be born into musical familes headed by master musicians. Balla Kouyaté is a virtuoso player of the balafon, the ancient West African ancester of the xylophone and marimba. 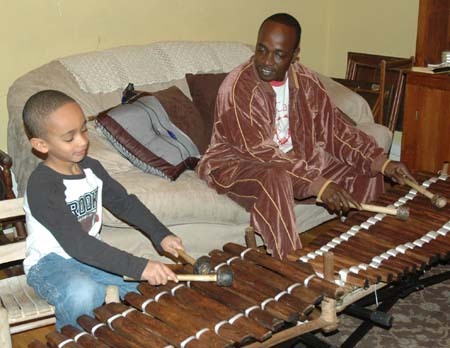 Above, you see him teaching his son Sekou the balafon. Sixto “Tito” Ayala comes from a legendary music and dance institution in Puerto Rico – the Ayala family. He is pictured here teaching a conga rhythm to his daughter Estefany Navarro. Come see and hear how West African djeli music and Puerto Rican bomba & plena are being passed on from one generation to the next.